Just imagine, you are sitting on a sunny beach, contentedly letting the warm sand trickle through your fingers. Millions of sand grains. What you probably can't imagine: at the same time, billions upon billions of bacteria are also trickling through your fingers. Between 10,000 and 100,000 microorganisms live on each single grain of sand, as revealed in a study by researchers from the Max Planck Institute for Marine Microbiology in Bremen. This means that an individual grain of sand can have twice as many residents as, say, the city of Fairbanks, Alaska! It has long been known that sand is a densely populated and active habitat. Now David Probandt and his colleagues have described the microbial community on a single grain of sand using modern molecular methods. To do this, they used samples taken from the southern North Sea, near the island of Helgoland, off the German coast. The bacteria do not colonize the sand grains uniformly. While exposed areas are practically uncolonized, the bacteria bustle in cracks and depressions. "They are well protected there", explains Probandt. However, the diversity of the bacteria, and not just their numbers, is impressive. "We found thousands of different species of bacteria on each individual grain of sand", says Probandt. Some bacteria species and groups can be found on all investigated sand grains, others only here and there. "More than half of the inhabitants on all grains are the same. We assume that this core community on all sand grains displays a similar function", explains Probandt. "In principle, each grain has the same fundamental population and infrastructure." We can therefore really discover a great deal about the bacterial diversity of sand in general from investigating a single grain of sand. 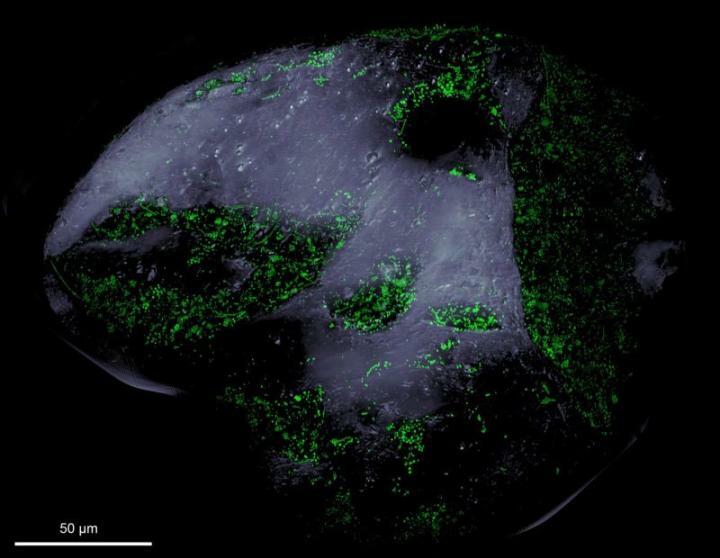 Sand-dwelling bacteria play an important role in the marine ecosystem and global material cycles. Because these bacteria process, for example, carbon and nitrogen compounds from seawater and fluvial inflows, the sand acts as an enormous purifying filter. Much of what is flushed into the seabed by seawater doesn't come back out. "Every grain of sand functions like a small bacterial pantry", explains Probandt. They deliver the necessary supplies to keep the carbon, nitrogen and sulphur cycles running. "Whatever the conditions may be that the bacterial community on a grain of sand is exposed to – thanks to the great diversity of the core community there is always someone to process the substances from the surrounding water." A European origin for leprosy?